What do you think of when you think of love & romance? Candlelight dinners? Long walks on the beach? A nice homemade dinner for two? 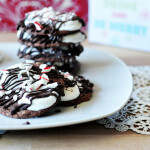 How about Mexican Chocolate Cookies? They totally make me swoon. Is that weird? Yea..maybe a little weird. 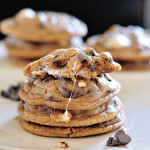 But who cares, these cookies just scream romance, decadence and total indulgence for me! I actually spent my honeymoon in Puerto Vallarta. If you guys have never gone, you need to!! 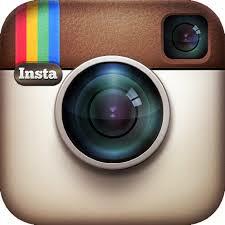 It’s beautiful and just the right balance of beach resort get away mixed with city and culture. It’s a short hop skip and a jump away from us in San Diego and where I’d much rather vacation than Cabo or Cancun. 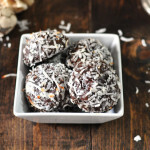 The perfect place for a honeymoon, which is why I named these Mexican chocolate cookies, the Honeymoons. These cookies just take me back every time. 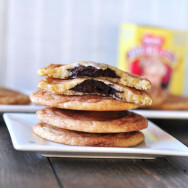 The cinnamon sugar cookie is soft and chewy and when you take a bite, the entire cookie along with the rich decadent Mexican chocolate truffle just melts in your mouth. Insert the girl from a godiva or lindt chocolate commercial….you know where they just get lost in the chocolate? That’s what these cookies are like. No joke. I will warn you with the same warning I give with all my stuffed cookie recipes. 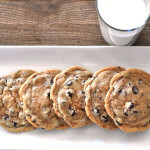 These cookies take a little time, preparation and effort to make but as always, they are SO worth it! The biggest thing to know is that you have to prepare the truffle fillings in advance so they are completely frozen before you bake them. And this dough needs to chill before baking as well. If you decide to prepare the cookies for that evening make sure you start the process in the morning, or better yet the night before. To prepare the truffle fillings. 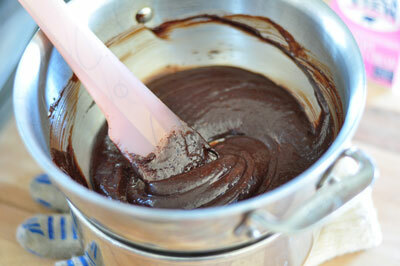 Melt the chopped Mexican Chocolate and chopped dark chocolate in a double boiler. Add the heated heavy whipping cream. And mix until combined completely. This will need to chill in the refrigerator for at least 45 minutes to an hour before you can form them into balls to freeze. 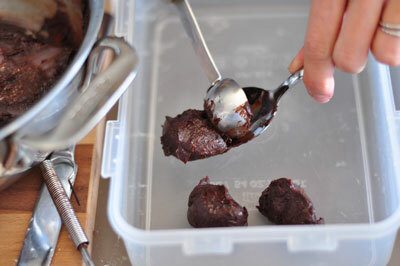 After you have chilled the truffle fillings, using a melon scooper or a teaspoon and a spoon, scoop rounded teaspoon size truffle balls into an air tight container. Freeze for at least 4-5 hours or up to 2-3 weeks. 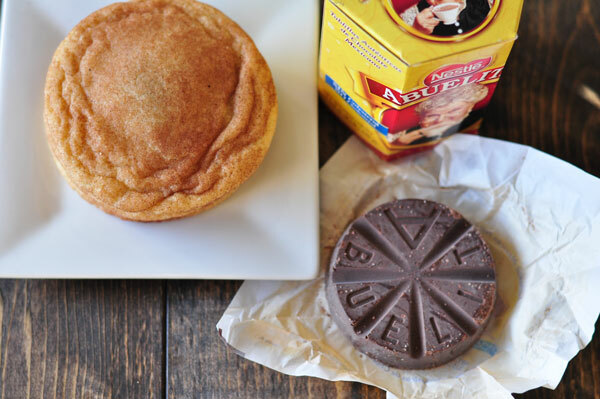 To make the Stuffed Mexican Chocolate cookies. With an ice cream scoop or cookie scoop, scoop about 3 tablespoons of cookie dough. and flatten in your hand. 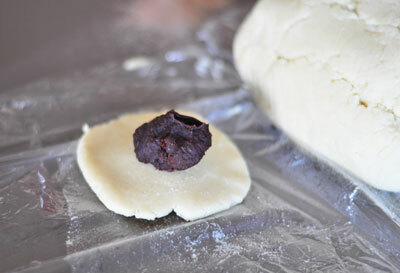 Place a frozen truffle filling in the middle of the dough. 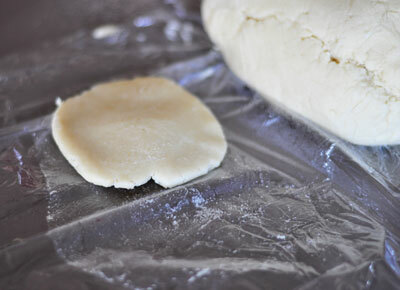 Roll the dough around the filling. Roll in cinnamon and sugar mixture and place on parchment lined baking sheet. 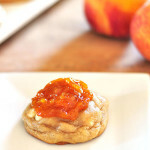 These cookies will totally romance you and sweep you off your feet! They do for me every time! What’s your idea of romance? 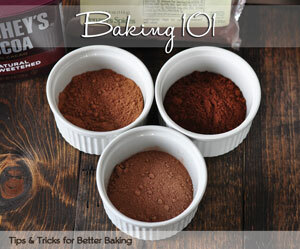 Make the Mexican Chocolate Truffle Fillings at least 4-5 hours (or until completely frozen) before baking. In a double boiler (a glass or metal bowl on top of a saucepan with a couple inches of simmering water), melt the dark chocolate and mexican chocolate. Microwave the whipping cream for 20 seconds. 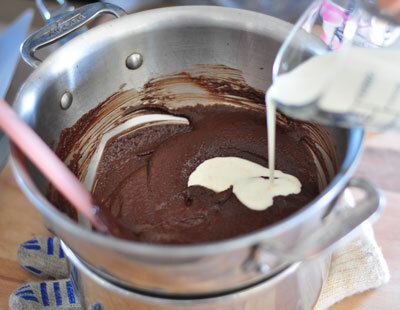 Add the cream to the chocolate and mix until completely combined. Chill in the refrigerator for 45 mins. After the mexican chocolate truffles have firmed a little in the refrigerator, scoop out a rounded teaspoon and place in a air tight container. Do not chill much longer than an hour or the chocolate truffles will become too hard to scoop. Do not allow the truffle scoops to touch or they will freeze together. Place the mexican chocolate truffles in the freezer or at least 4-5 hours or until completely frozen. Make the batter. Cream the softened butter and sugar in a stand mixer with a paddle attachment. Add the eggs in one at a time and mix until incorporated. In a separate bowl, sift the flour, salt, baking powder an baking soda. Slowly add the dry ingredients into the wet ingredients and mix to combine. Cover in plastic wrap and refrigerate at least an hour. 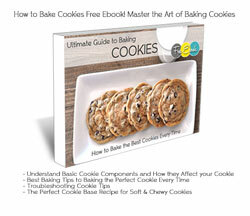 Preheat the oven to 375 degrees F. Line cookie sheets with parchment paper. Scoop 3-4 tablespoons of dough with an ice cream scoop or cookie scoop. 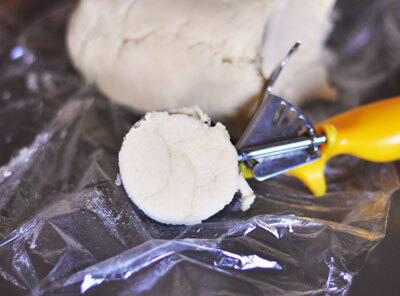 Flatten the dough in your hands and place a frozen truffle ball in the middle of the dough. 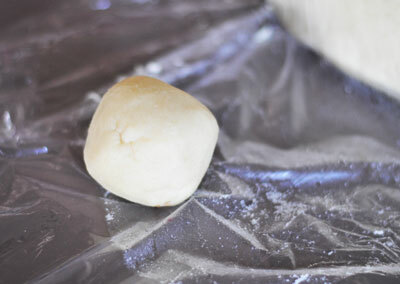 Roll the dough around the filling, forming a ball. Make sure none of the filling is showing and the dough covers it entirely. 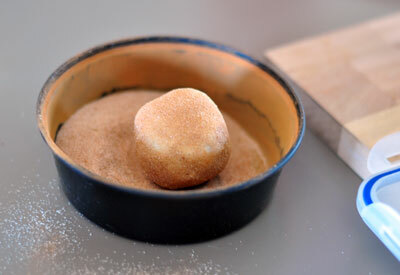 In another small bowl, combine the tablespoon of cinnamon and 3 tablespoons of sugar and mix together. 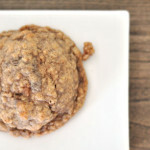 Roll the dough with the truffle filling stuffed inside in the cinnamon sugar mixture and place on the parchment lined cookie sheet 2-3 inches apart. These cookies spread. Bake cookies 9 minutes or until the edges are slightly browned. Do not over bake. Cool 15 mins before serving. Store in an air tight container for 5-6 days or freeze for 2-3 months. 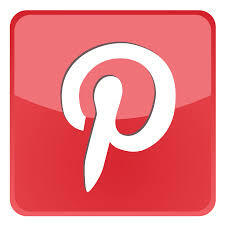 This recipe is linking up to these fun link parties! Thank you Stacy!!!! You are too sweet and I so appreciate you coming by to say hi! Happy New Year to you as well! 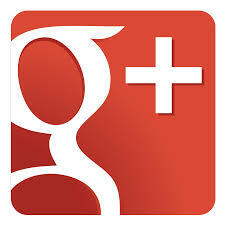 Thank you Zeza! You are so very welcome! 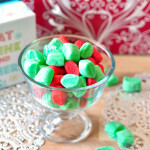 I hope you try these and fall in love like I did! 🙂 Happy New Year! I love all these stuffed cookie recipes – delicious! Thanks Christine! Happy New Year! How yummy! I love stuffed cookies. 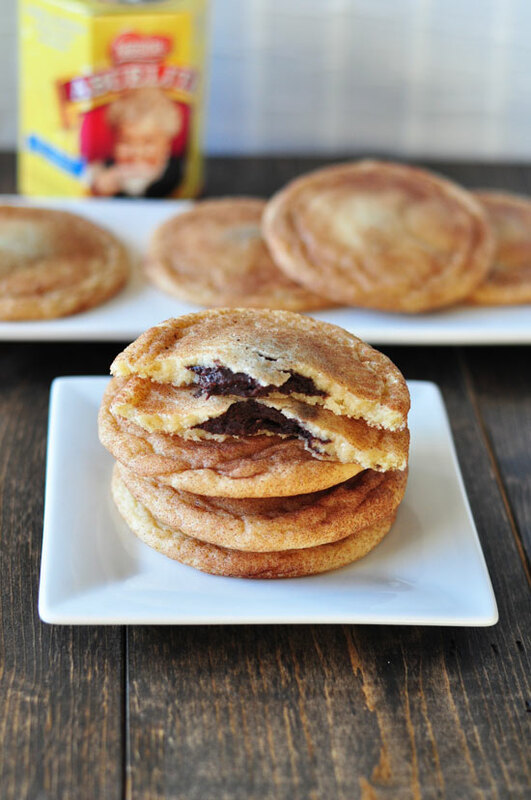 Cinnamon sugar and chocolate, the best of both worlds! Right? Stuffed cookies are the best! Happy New Year! 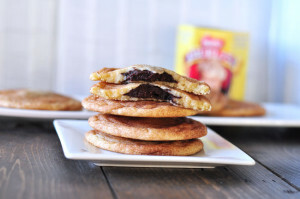 Cinnamon, sugar and chocolate?! Yes please! I am so all over these cookies. 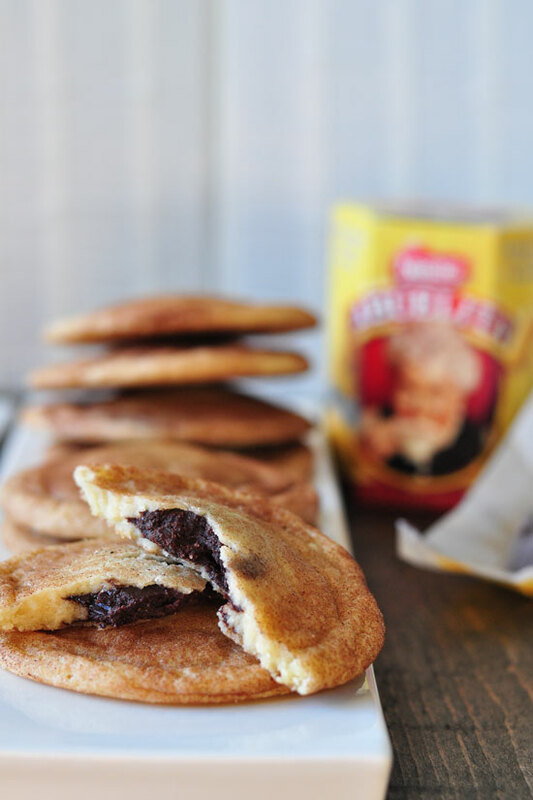 Plus, I love a little stuffed cookie surprise party for my taste buds! Surprise filled cookies are super fun and who doesn’t love surprises! Thanks Taylor! Seriously?!?! 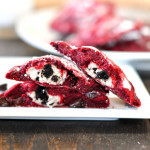 I am peeing my pants with joy over the fact you are sharing this recipe!!!!!!! Oh yum! I absolutely love the look of that rich chocolate stuffed inside. I’m in! Looks fantastic! Thanks Kristi!! You have to try these! Totally addicting! Hope you have a fabulous New Years!